Put oil in dutch oven and heat to 375 degrees for Frying. Stir until chicken is done. If using canned chicken, heat for about 5 minutes. While cooking chicken, dice potatoes and onion. Add potatoes and onion to chicken; stir for 10 minutes. Mix milk and flour in a cup. Add milk mixture and all ingredients except crescent rolls to chicken mixture. If it seems too thick, add more water. Bring chicken mix to a boil while stirring. Unroll crescent rolls and create a dough layer on top of the chicken mix. Put lid on dutch oven and Bake at about 350 degrees. Check at 20 minutes, then every 5 to 10 minutes. Pot Pie is done when rolls are golden brown and flake. Let me know how you enjoyed your Chicken Pot Pie! Made this recipe this evening, it was excellent, thanks! I made this for the family tonight. It was a hit. I'll use this again the next time we're camping. Every time I make this c - pot pie it's awesome. Thanks for an easy legit recipe Dutch Oven Dude. Good but needed salt and had trouble getting the potatoes done all the way through. Made this tonight. 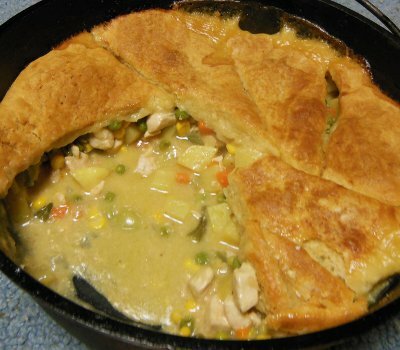 I am not a chicken pot pie fan, but this was really good and will be made again. Approximately how long does this recipe take? I am very new to DO cooking and I wouldn't want to be eating dinner at 9:30 instead of 6:00. Thank you! @Joe - Once you have your coals ready and dutch oven warmed up, it takes about 60 to 75 minutes. Add another 15 minutes if you are cooking raw chicken instead of using canned. I made this over the last weekend for a camping trip. Pre- cooked my chicken and diced everything at home and bagged it, and went with the powdered milk for ease of packing. Needed a little salt and pepper but was definitely one of the best DO recipes I've made. Tip: Do not drain your chicken, the extra moisture was perfect. 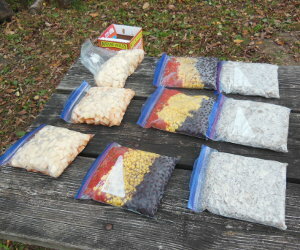 @Mason - Packaging everything at home can sure make the cooking at camp more relaxing, and less garbage to pack. Last year, I got to cook three D.O.s worth of Cowboy Stew, Frito Casserole, and McPancakes so I diced, cooked, and froze at home. It was fun, and I got to show some youth how D.O. cooking is easy, tasty, and easy to clean up. This was fantastic, my son and I made this and it was a hit. Thanks for the great recipes.